Pen cap for 1970s Sheaffer Imperial 834 fountain pen. Solid sterling silver in a diamond etched pattern with gold plated clip. Has original cap sticker. New old stock with some polishing marks. 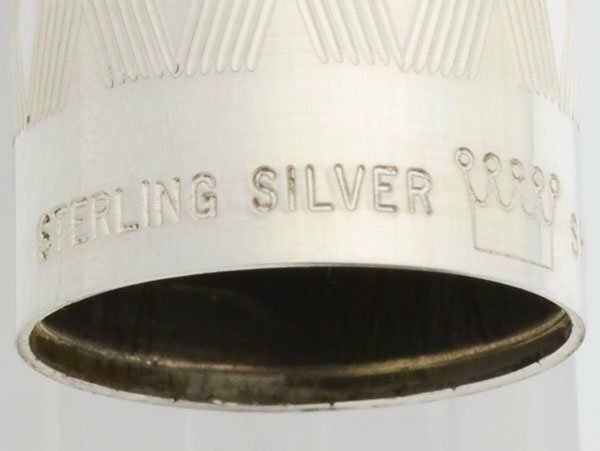 Product Name This cap is for a Sheaffer Imperial 834 fountain pen, identified by the sticker on the cap. Condition New old stock condition with some light storage marks. There are polishing marks and general storage wear. No brassing on the clip or dents anywhere. The original cap sticker is in superior condition.